I’m writing and posting this latest entry for the Physics Groupie Blog a few hours before the big event this evening as the Mars Science Laboratory mission closes in on the planet Mars for the spectacular deposit maneuver of the Curiosity rover on the planet’s surface and the start of a 2 year mission to explore the Gale Crater for evidence of life on the 4th rock from the sun. I decided to publish this ahead of the “7 minutes of terror” during which time a very complex series of events must complete in perfect unison otherwise NASA will experience some serious cosmic egg on its face. But why before? Because I’m holding my breath in recognition of the importance of this mission and how its success (or failure) may signify the future of planetary science for the next decade or so. At a price tag of $2.5 billion, a spectacular failure could fuel the critics’ efforts to quash funding for planetary exploration for many years. I know what’s at stake here and my unbridled enthusiasm for space science and U.S. leadership in this arena makes me a tad bit queasy at times like this. I applied for press credentials to witness this nail-biter first hand at nearby JPL which is mission control for MSL. JPL’s press contact Guy Webster promptly replied to my request and welcomed my interest to cover the landing for the Physics Groupie blog. He turned me over to a formal credentialing process and alas that’s where the story ends. Apparently NASA is blogger unfriendly and I was flatly denied and instead was told to watch NASA TV. 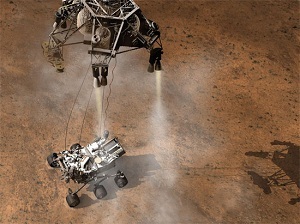 So that’s exactly what I plan to do tonight – NASA TV will be my official source of MSL news. There are a couple of cool Curiosity landing parties around town – at the Griffith Observatory and Planet Fest put on by The Planetary Society is hosting a gathering. The latter even held a special “Mars Party” last night over at the Paseo Colorado Promenade in Pasadena featuring Bill Nye “The Science Guy” and Star Trek’s Robert Picardo to usher in the festivities leading up to tonight’s big event. But I decided to watch the Curiosity birthing-event in the privacy of my own broadband connection. It will be a late night. I’m crossing my high-gain antenna! Update: a short while after my nervous Curiosity post, I went outside in the night sky to gaze toward the Western horizon hoping to catch a few Mars photons. I was late, Mars had already set. Still, I thought to myself about the red planet, "You're going to have a visitor very soon now." And that's just what happened as the EDL procedure went off without a hitch and the start of MSL science commences. Fantastic!